Glass and goo the hull is glassed on the outside. On the inside only the floors get a layer of glass. 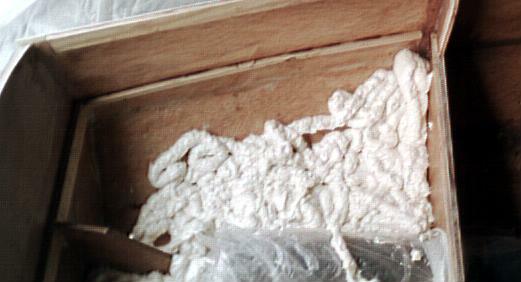 Both compartments are completely foamed except for a hole (pipe visible in shot above) which will become watertight compartment for small objects. 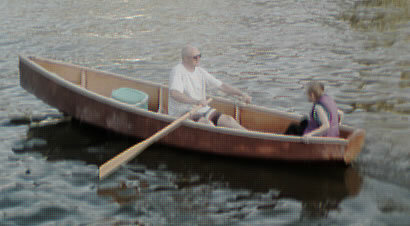 With one 80 kg person bow and transom are well clear of the water. There is no wake at all. With a 30 kg passenger sitting as far back as he dared. The bow has lifted somewhat but the transom is still clear. The oars are 30 cm too short. As expected initial stability is weak (round bottom) but once seated, the center of gravity is just right. I can walk from stern to bow with no problems there is enough volume to support my weight in the ends. 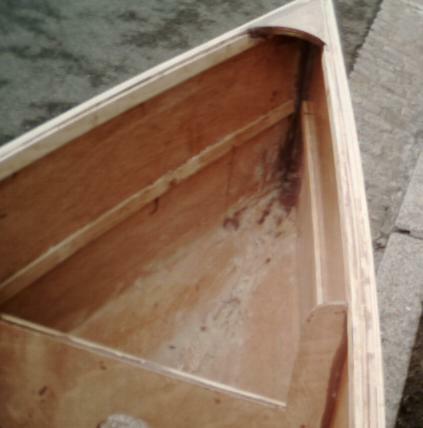 The transom will support a 27 kg 5 hp outboard. My original idea of using a sailboard fin under the skeg for additional directional stability in the wind seems to be needed when rowing alone. The bow lines got tested: two motor boats leaving huge wakes went by and no water splashed into the boat. The design seems seaworthy in waves to 50 cm high.